Monsignor Joseph Clifford Fenton (January 16, 1906 - July 7, 1969), a priest of the diocese of Springfield, Massachusetts, was professor of fundamental dogmatic theology at the Catholic University of America and editor of the American Ecclesiastical Review (1943–1963). He is considered one of the most outstanding American Catholic theologians of the 20th century, serving as a peritus for Cardinal Ottaviani at the Second Vatican Council. He was also Secretary of the Catholic Theological Society of America. Fenton was born in Springfield, MA, on January 16, 1906. He was the elder son of Michael Francis and Elizabeth (Clifford) Fenton. Fenton received a B.A. degree from College of the Holy Cross in Worcester, Massachusetts, in 1926. He studied for the sacred priesthood at the Grand Seminary in Montreal, Canada, until 1930 and received an S.T.L. and J.C.B. from the University of Montreal. On June 14, 1930, Bishop Thomas Michael O'Leary ordained Fenton at St. Michael's Cathedral in Springfield, Mass. He obtained a doctorate in Sacred Theology (S.T.D.) from the Pontifical University of Saint Thomas Aquinas, Angelicum in Rome in 1931 under the direction of Fr. Reginald Garrigou-Lagrange, O.P. 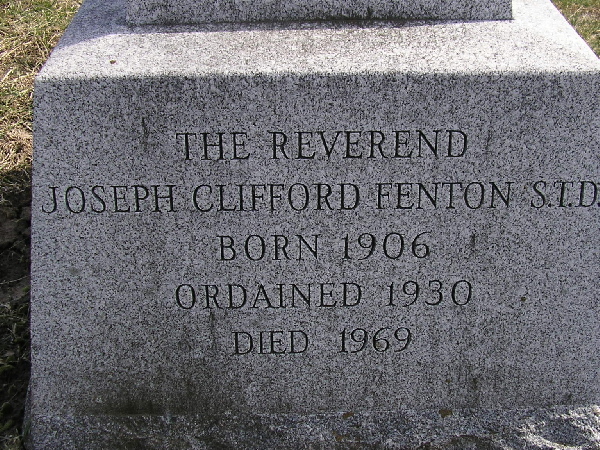 Fenton was a curate at Immaculate Conception Church in Easthampton, MA from 1931 to 1933) and at St. Joseph's Church, Leicester, MA from 1933 to 1934. He taught philosophy at Saint Ambrose College, Davenport, IA from 1934 to 1935). At the formation of the Catholic Theological Society of America in 1946, the then-Fr. Fenton served as one of its first officers in the position of Secretary. Fenton was a familiar figure with his cassock and biretta on the campus of The Catholic University of America for 25 years. His students remember him as an imposing person who lectured dramatically and often challenged them with unexpected questions. Fenton's colorful expressions and trenchant observations became legendary. During his career, Fenton received many ecclesiastical honors from Rome. The Holy See named him a papal chamberlain (1951), a domestic prelate (1954), and a protonotary apostolic (1963). Recipient of the papal medal, Pro Ecclesia et Pontifice (1954), he belonged to the Pontifical Roman Theological Academy and served as a counselor to the Sacred Congregation of Seminaries and Universities (1950–67). Fenton died in Chicopee Falls, MA, on July 7, 1969. The twenty-first century has seen something of a revival of interest in Fenton's books. In 2006, his book The Catholic Church and Salvation, a scholarly in-depth explanation of the Catholic dogma "No Salvation Outside the Church", was republished by the Society of St. Pius V's Seminary Press in Round Top, New York. In 2016, his book We Stand with Christ was republished by Emmaus Road Publishing under the title Laying the Foundation: A Handbook of Catholic Apologetics and Fundamental Theology. Also in 2016, Christian D. Washburn (Associate Professor of Dogmatic Theology, at the Saint Paul Seminary School of Divinity, in St. Paul, MN) edited a collection of Fenton's essays from American Ecclesiastical Review under the title The Church of Christ: A Collection of Essays by Monsignor Joseph C. Fenton, published by Cluny Media. Cluny Media has overseen the bulk of the revival in Fenton's works, releasing new editions of Fenton's The Theology of Prayer and The Concept of Diocesan Priesthood, under the title The Diocesan Priest in the Church of Christ, and including Fenton's dissertation—The Concept of Sacred Theology—in its Thomist Tradition Series, under the title What Is Sacred Theology? During the first years of the Second Vatican Council, Fenton was a member of the preparatory Theological Commission, the Doctrinal Commission, the Commission on Faith and Morals, and also a peritus. As a controversialist, he is best remembered for his aggressive opposition to John Courtney Murray, S.J., on religious freedom and on the relationship between Church and State. In December 1963, Msgr. 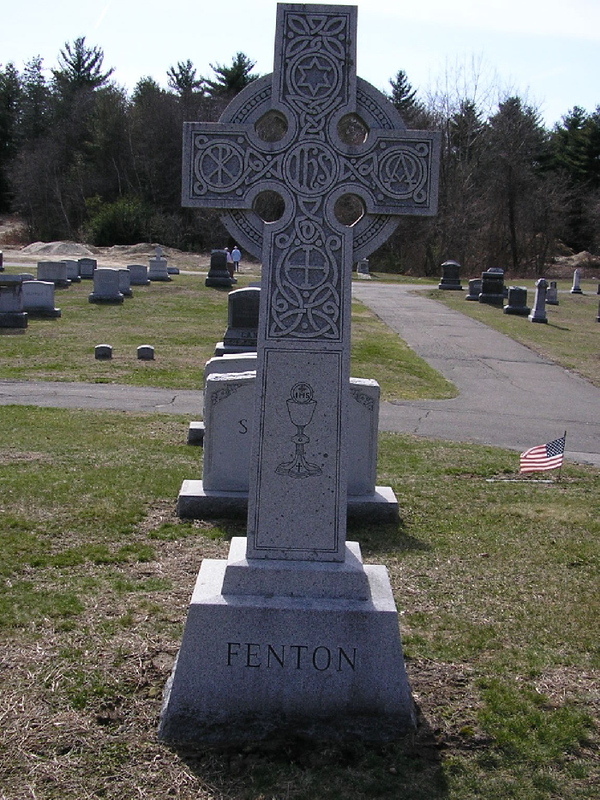 Fenton resigned as editor of the American Ecclesiastical Review "because of poor health" and became pastor of St. Patrick's Catholic Church in Chicopee Falls, Mass. "He spent the remaining years of his life attacking from the pulpit the liberal reforms within the American church", according to one biographical source. Fenton died of an acute heart attack, apparently in his sleep, on July 7, 1969. He is buried at St. Thomas Cemetery in Palmer, Mass. Photographs of his tombstone may be found here and here. Msgr. Joseph Clifford Fenton is sometimes confused with Fr. Francis E. Fenton (no relation), founder of the Orthodox Roman Catholic Movement. ^ Komonchak, Joseph A. "Fenton, Joseph (1906-69)." Encyclopedia of American Catholic History (Collegeville, Minnesota: Liturgical Press, 1997), 505-506. ^ a b Hoehn, Matthew, ed. "Reverend Joseph C. Fenton 1906-." Catholic Authors: Contemporary Biographical Sketches, 1930-1947 (Newark, New Jersey: St. Mary's Abbey, 1948), 244. ^ Burke, Eugene. "A Personal Memoir on the Origins of the CTSA". In Proceedings of the Thirty-Fifth Annual Convention of the Catholic Theological Society of America 35 (1980): 337-347. ^ GRANFIELD, P. "Fenton, Joseph Clifford." New Catholic Encyclopedia. Vol. 5. 2nd ed. Detroit: Gale, 2003. 684-685. Gale Virtual Reference Library, 29 Aug 2009. ^ American Ecclesiastical Review 150 (January 1964), 1. ^ Carey, Patrick W. "Fenton, Joseph Clifford". Biographical Dictionary of Christian Theologians (Westport, CT: Greenwood Press, 2000), 192. ^ Obituary, Springfield Union (July 8, 1969), 27.